Gimme a BUDA, gimme a PEST… put them together and what do you get? In an attempt to cling on to my son’s childhood a moment or two longer (pre his impending 18th birthday). 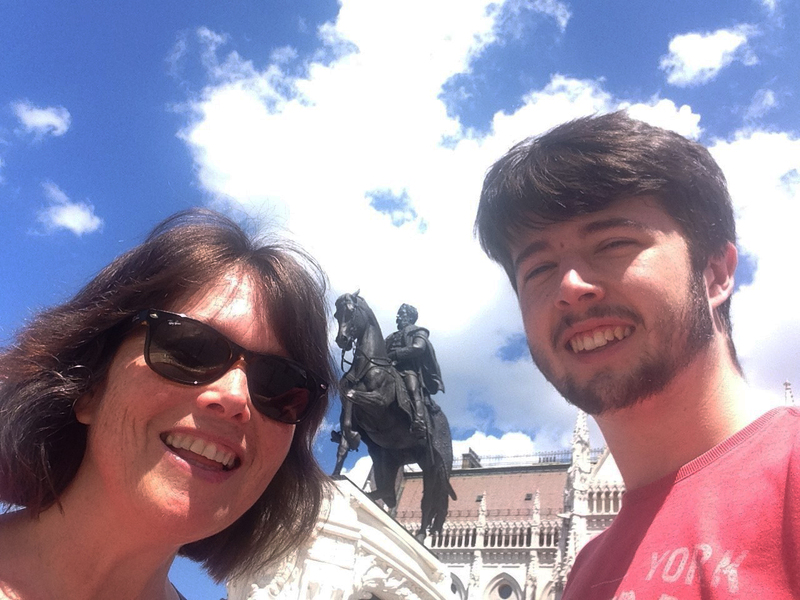 I decided that we’d have a mother and son trip to a place of his choice…and he chose, well, you know where he chose to go if you’ve been paying attention so far. From Newcastle, it takes two flights to get to Budapest, we flew out via Paris – Charles de Gaulle. Our second flight was packed and my son and I couldn’t sit together. Instead, he got to sit next to an 8-year-old girl and her mother, whilst lucky ole me got to sit between a young Hungarian travel guide and a quirkily dressed Parisian guy…both of whom chatted to me and gave me hints and tips about getting around the city – result. The driving is a bit crazy over there, however, we got to our hotel in one piece and not too shaken up and were happy to be basking in 31 degrees of sunny weather in the late afternoon. Our hotel was about a minute away from a metro which took us to the city centre in 15 minutes, so once we’d dumped our bags in the rooms; after fighting our way through a crowd of Americans and athletic types in reception as the Fina swimming championships were in full swing! Off we went to explore the city. Oh, must mention the escalators in the city centre metro stations… flippin fast and steep! If you have vertigo I’d say it’s a no go! The city feels safe, is litter-free and has a great cosmopolitan vibe. As the sun set we noticed a lot of teenagers gathered in one of the grassy squares to play music politely, chat quietly and not cause anyone any bother - bliss. We only had two full days in the city, so we got up and got out early doors on our first day and had a thorough exploration of the place, we got the metro to the Buda side of the river Danube, it doesn’t look too pretty down near the station, but once you climb some steep steps (in my case chasing after my leggy son who loped up them in no time) you come to a beautiful street and further along the castle…well, the hill we climbed is called castle hill – so that all made sense! I was very keen to go on the Budavari Siklo – or the funicular as we English call it. As it turned out, the views from the top were stupendous, the ride down was, well… you could easily walk down another set of steps and not bother with it… once you’re on it there’s a feeling of mild disappointment and a vague sense of anti-climax, but I’m not sure exactly what I was expecting now I think of it..? Do you remember Segways? Well they’re a ‘thing’ in this city, there were a lot of people on them weaving through the crowd, but as the streets are mostly pretty wide and there are a lot of paved areas, collisions with walking tourists didn’t appear to be an issue. Day 1 over, back to the hotel to chill out and sleep like a baby. Let’s continue the story next blog!